2013/07/29: Update: Watch the episode or read the transcript! Mike Rohde’s The Sketchnote Handbook (see my sketchnotes of it) focuses on pen-and-paper sketchnoting. I really enjoy digital sketchnoting, although there’s a bit more of a barrier to entry in terms of hardware. I’ve figured out a pretty sweet workflow for live-publishing conference/event sketchnotes so that you can catch people while they’re looking at the Twitter hashtag. Mike and I will be talking about digital workflows and tips for one of his podcasts, and I wanted to sketch my thoughts/talking points in preparation. Not specifically mentioned there because it’s more of a blogging setup, but WordPress + NextGen Gallery + Windows Live Writer + Text Templates plugin = great. Like this? Check out my other sketchnotes and visual book notes. 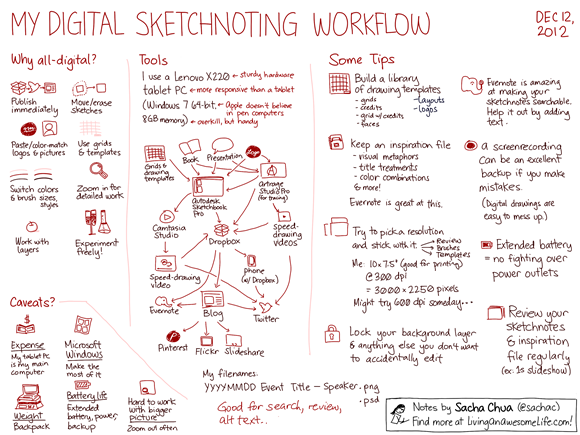 Want me to sketchnote your event? Know of any interesting tech / business talks coming up? I’d love to hear from you!